On any given day of the work week, dedicated service providers in the Early Intervention Program, at both the Queen Alexandra Centre for Children’s Health and the satellite campus at the West Shore Child, Youth and Family Centre, are hard at work providing exercises, new routines, therapies, and plenty of encouragement to the kids with health challenges they see. Stephanie Lam is one of these specialists who works to support the health of Island kids. Stephanie is a physiotherapist in the Early Intervention Program at the Queen Alexandra Centre for Children’s Health, and has been since 2011. As a physio, Stephanie works with a range of kids and relies on specialized equipment – everything from small toys for developmental play to technologically advanced pieces of equipment like the Wizzybug – to enhance the work she’s doing. The big pieces are especially important, as they’re often the least accessible to families due to their huge price tag. “It’s cool to bring these big pieces in because some of them are part of our loan library. That means families can borrow the equipment for about three months and try it out, either before they purchase their own or as they wait for funding to come through,” says Stephanie. In their day-to-day work, Stephanie and her colleagues use this equipment to aid the physical and social development of countless kids. While your donor dollars have funded many pieces of specialized equipment, here are just three pieces of equipment that you’ve recently helped make accessible to Island kids. 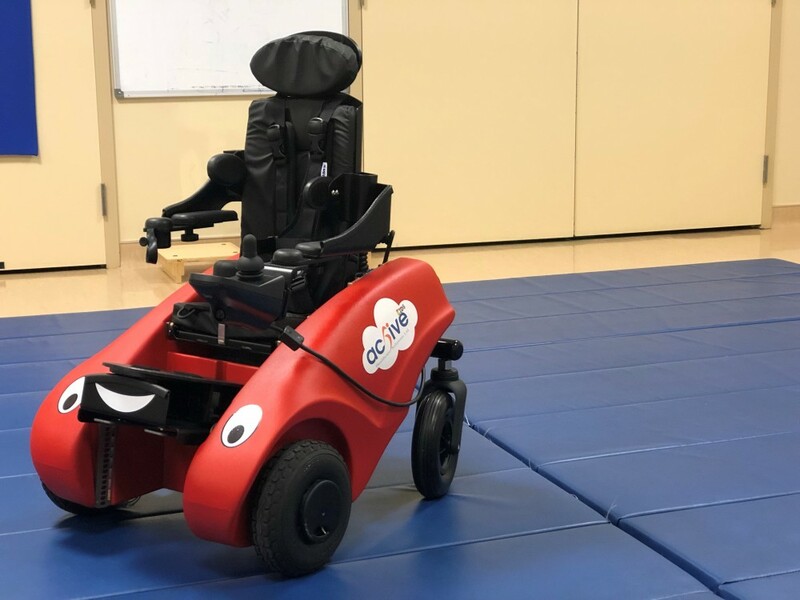 How the product works: This product is a motorized chair designed specifically to help kids with physical challenges, like cerebral palsy or muscular dystrophy, move independently — sometimes for the very first time! Kids as young as 14 months and up to five years old can sit in the motorized chair and use the joystick to move and play wherever they’d like. The Wizzybug can be used inside and outside, giving kids the ability to be kids! 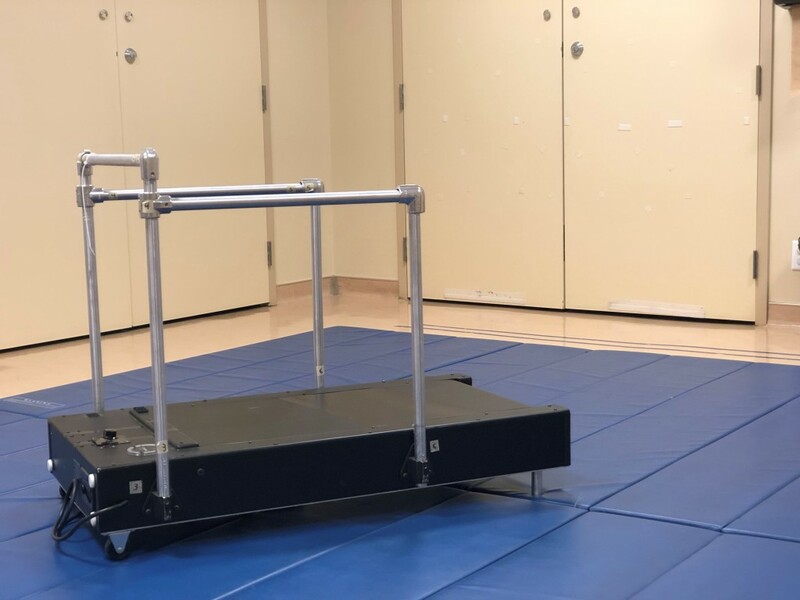 How it helps Island kids: Island kids coming to see a specialist in the Early Intervention Program at either the Queen Alexandra Centre for Children’s Health or the West Shore location might get a chance to use this innovative piece of equipment. According to the team’s specialists, what’s great about the Wizzybug is the joystick, which controls the device. Kids can use the joystick themselves, meaning they can move around independently in the Wizzybug. Its design is also fun and appealing to kids – this isn’t a piece of scary, medical equipment! It’s also a great piece of equipment for the specialists. It’s adjustable, meaning the one Wizzybug can be used by a wide variety of Island kids, regardless of the child’s age, height, or health challenge. This item is not part of the Queen Alexandra Centre for Children’s Health loan library. How the product works: This piece of equipment is adjustable so that the child’s body position can easily be changed. 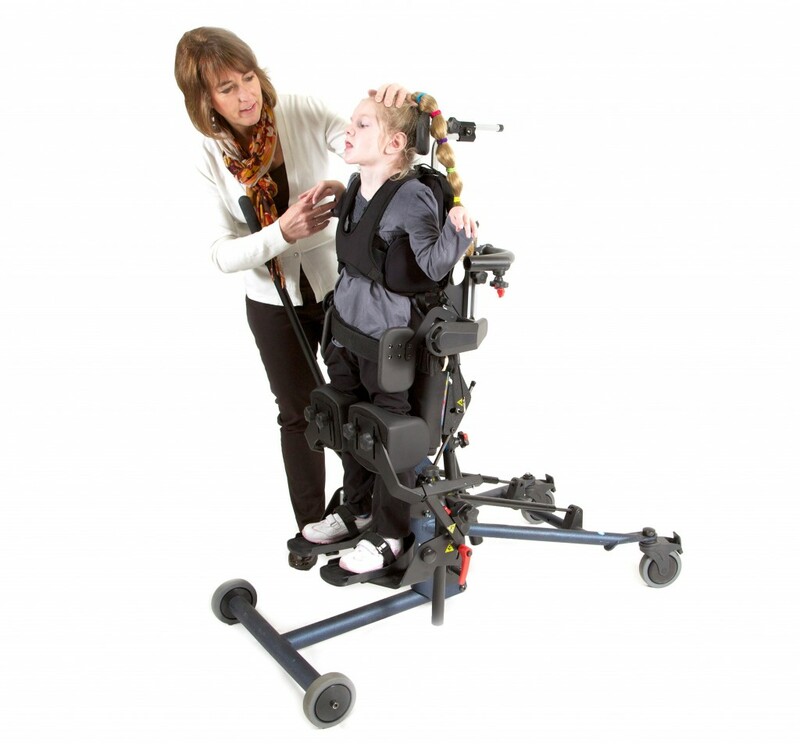 The stander can take the child from seated to a complete vertical standing position, and to any position in between. How it helps Island kids: According to Stephanie, this piece of equipment offers numerous physical benefits for kids. “Standing is so good for our bodies – we’ve evolved to stand! When kids stand with the Bantam stander, their circulation and respiratory systems are gravitationally challenged in a different way, their visual perspective of their environment changes, and it helps with their overall joint development and bone health,” says Stephanie. “The great thing about a stander like the Bantam, is that it is able to incline slowly, both in a seated position or a flat position, so that children who are not used to standing up at all, can slowly build their tolerance.” She adds that standing is also a great weight-bearing activity and therefore imperative for a child’s development of their long bones and their hips. This product is part of the loan library. Stephanie adds that there are three sizes available – small, medium, and large – so kids of all ages can make use of this piece of equipment. How the product works: This is very similar to treadmill you’d find in your gym down the road, except that it’s designed to be smaller and run slower for the kids who walk, crawl, and even do hand exercises on it. How it helps Island kids: The benefits of the pediatric treadmill are seemingly endless! According to Stephanie, this piece of equipment helps Island kids who live with a range of health challenges. It might be used to help kids take their first steps, therapists can help manipulate kids’ legs as they walk, and it is also a useful piece of equipment for therapists guiding kids through crawling. And it’s a great form of weight-bearing cardiovascular exercise that can tone and strengthen muscles. “Kids can walk independently or supported on the treadmill, so it can help increase the number of steps they’re taking or we can help support them as they learn to go through the movements,” says Stephanie. Thanks to the support of generous donors like you, specialists like Stephanie use specialized, innovative equipment to help Island kids access the health care they need.